Microsoft Corp. MSFT +0.32% Chief Executive Satya Nadella recently pledged to be “bold and ambitious” to remake the company and its culture. The first task, he signaled in a memo on Thursday, would be cleaning up some of his predecessors’ messes. The recently named Microsoft chief is cutting up to 18,000 jobs in the next year, or about 14% of the company’s workforce, the largest layoffs in its history. About two-thirds of the cuts would come from its phone and tablet staff, which bulged after former CEO Steve Ballmer agreed to buy Nokia Corp.’s NOK1V.HE +0.53% handset business last fall. Microsoft said it plans to eliminate as many as 18,000 jobs, or 14% of its workforce, over the next year, part of a sweeping plan to streamline its operations following the recent acquisition of Nokia’s devices and services business. Scott Thurm joins MoneyBeat. The shape of the job cuts reflect a tough reality for Mr. Nadella: He must repair parts of the company he inherited from former CEOs Bill Gates and Mr. Ballmer before he can reshape Microsoft as he wants. 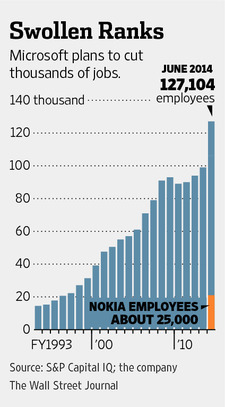 Outside of staff overlap with Nokia, the cuts amount to about 5,500 people, or about 5% of the company’s staff before the Nokia deal pushed it to 127,000 people. Microsoft declined to make Messrs. Gates and Ballmer available to comment. The company said the job cuts and undisclosed “asset-related” charges would cut pretax earnings by up to $1.6 billion over the next four quarters. Investors sent shares up 1% to $44.53 on the Nasdaq Stock Market. Mr. Nadella also showed glimpses of his blueprint. He plans to revamp the way Microsoft organizes its engineers and will close a high-profile project that Mr. Ballmer launched to create television-like programming for its Xbox videogame game console. Mr. Nadella also halted work on a line of Nokia smartphones powered by the Android operating system, which had put Microsoft in the position of supporting the software of rival Google Inc.
One an advantage for Mr. Nadella is that, unlike many companies that carry out large layoffs, Microsoft is financially healthy. Revenue is growing, and analysts project the company generated $22.5 billion of net income in the year ended June 30. The company’s stock has outperformed market indexes since Mr. Nadella took over, and a recent turnaround in personal-computer sales is likely to prove a financial windfall for the company. His challenge is making Microsoft relevant in fast-growing technology areas including mobile computing. Executives fear the company’s empire in corporate software could be at risk if it doesn’t act decisively. The cuts may not satisfy critics who want Mr. Nadella to be bolder and go deeper into reshaping sprawling operations that range from phones, videogame machines and tablet computers to corporate-database software, Web advertising, video-calling services and PC operating systems. Its advertising-sales businesses, marketing operations and engineering teams at Windows will lose staff under the coming staff reductions, people familiar with the matter said. Microsoft also is closing the nearly two-year-old Xbox Entertainment Studios, whose 150 workers made television-like programming for the Xbox that critics called a wasteful diversion. Microsoft also is culling the armies of vendors and contract workers that fill many jobs from security to engineering—but which don’t show up in its workforce figures. For example, Mr. Nadella said it was no longer acceptable for product groups to refuse to share software code with their colleagues at other divisions, as Windows and Office teams sometimes have done. 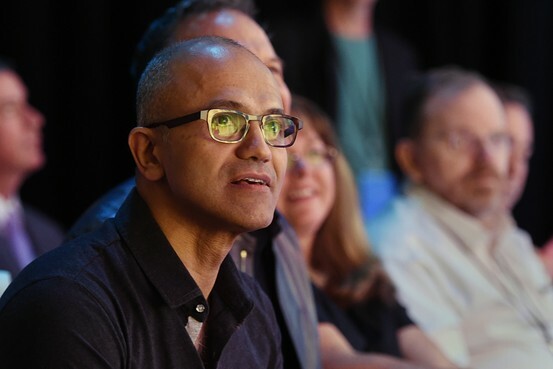 Mr. Nadella also has been slimming separate engineering teams responsible for developing software, testing it for problems and managing business operations. “Maybe the time has come for us to reinvent what they do, in spite of the fact that we have been successful,” Mr. Nadella said on Monday. Some investors said they now want Mr. Nadella to give more direction on how Microsoft can improve in mobile devices, where it trails behind industry leaders Apple and Samsung Electronics Co. 005930.SE -0.30% , and how the company can simultaneously squeeze additional costs while investing in high-potential areas. “We want to see clear definition out of the Nokia acquisition. What are they really going to do, what’s the road map?” said Kevin Walkush, an analyst for Jensen Investment Management Inc. The Lake Oswego, Ore., fund manager owns 6.6 million Microsoft shares. Microsoft is scheduled to report its quarterly financial results next week, and Mr. Nadella has said he would detail then the financial impact of his latest plans for the company. Analysts said the cuts to the Nokia business, which were larger than expected, may indicate that business is in worse shape than Wall Street believes. Their belief Mr. Nadella may reinvest job-cut savings helped cool the early rally in its shares. “Shigoto” is the core of all the HR strategies of aamra.